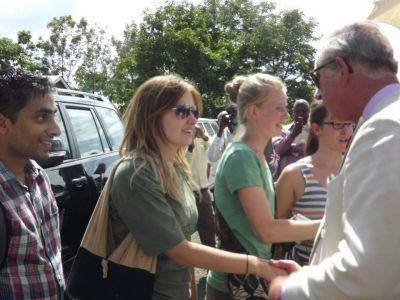 Earlier this month, on Wednesday 9th November, our Projects Abroad volunteers were visited by members of the British Royal Family, his Royal Highness Prince Charles and his wife, Camilla at Leganga Primary school. 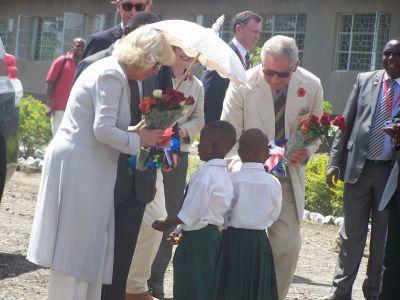 The surprise visit from the Duke and Duchess of Cornwall was certainly a memorable and rewarding moment for local children and teachers, as well as our volunteers. The school has 300 students aged from 5 to 12 years old, and is situated in an area known as USA River, on the outskirts of Arusha town. The volunteers have been working hard for the past few weeks at Leganga, repainting walls, fixing windows, and starting the building of a new toilet block. It was a proud moment for all that the royal couple could see the volunteer’s hard work and the transformation of the school. Volunteers involved in the action were Abby Main from Australia, Amardeep Legha from England, Michelle Kristensen from Denmark, and Stephanie Schoenberger and Alexandra Tesch both from Germany.